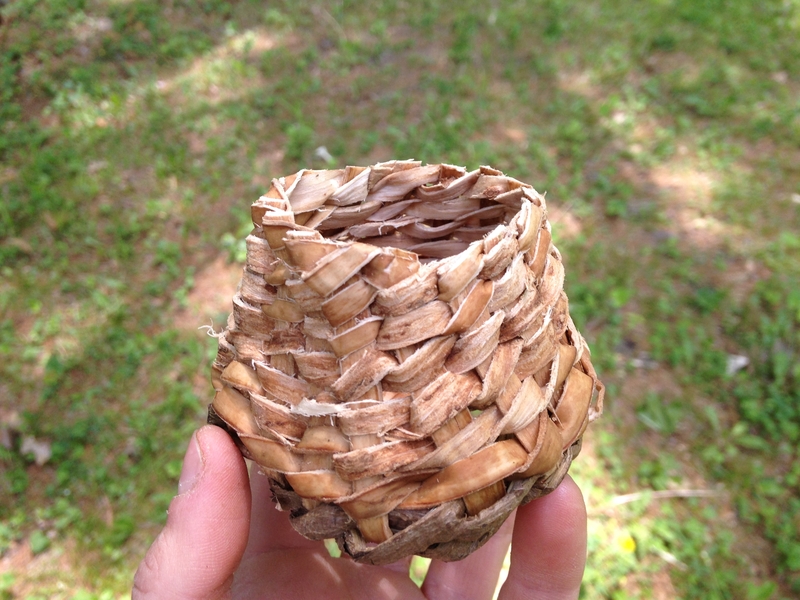 After learning how to use bark in basketry during my internship in Asheville this winter my big project for this year became incorporating bark into my repertoire of natural materials. 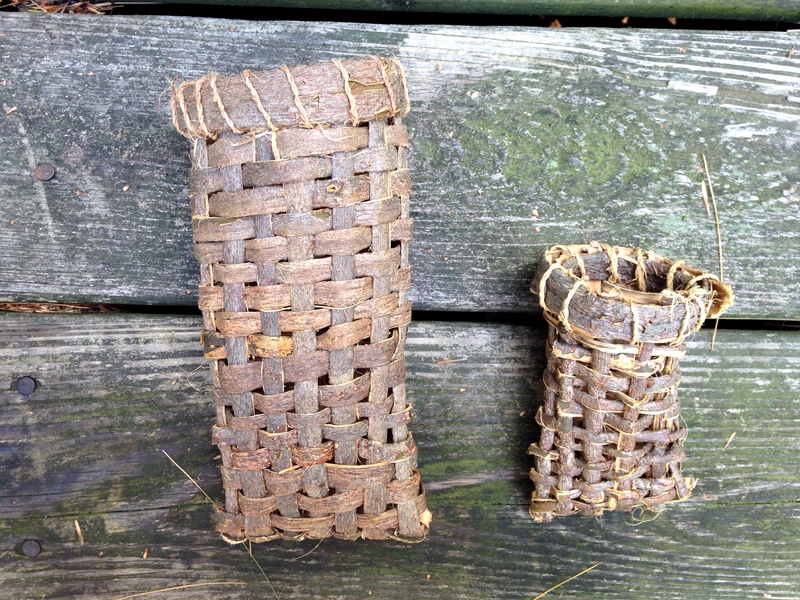 Although I processed already harvested bark and learned to weave with it down south, actually finding, cutting down, and harvesting the bark from the trees is a new adventure! I’ve done a lot of reading and research about working with bark and all winter I’ve been waiting for the leaves on the trees to unfurl and keeping an eye out for individual trees that might be candidates for using. Finding trees may be the most daunting part. In my area (the Hudson Valley in NY state) I’ve been looking for (in order of desirability) Basswood, Tulip Poplar, Elm, Hickory, Willow, Ash, Maple, and maybe a couple other species. You have to cut the tree down to use its bark so I am primarily looking for trees that are being cut down anyway for other reasons. Otherwise if I have to take a tree down from the forest my top priority is finding an individual tree whose removal will benefit, not hurt, the forest as a whole. For example, if a stand of basswood are growing really close together and need to be thinned. Or if a tree is damaged at the top, dyeing, or interfering with the growth of other, stronger trees. And if none of those conditions are met I’m looking for a tree that is abundant, not rare, in any given area. Luckily I have an arborist for a boyfriend so finding trees becomes a little easier! 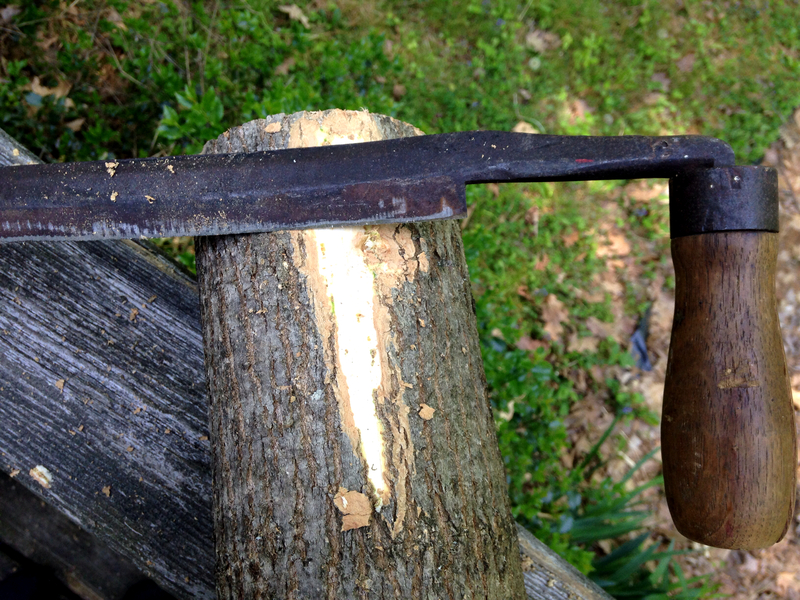 It was on a job that involved him cutting down a few small trees where I found my first logs to harvest bark from. They turned out to be White Ash. Obviously Black Ash is the holy grail of ash trees, but it is uncommon so I was happy to have the white ash. I wasn’t sure at first if white ash could be used as a substitute for black and didn’t find much literature on google to answer my question. In the end a few sources seemed to say it was possible, but that white ash just wasn’t as nice or refined as black. Either way I wanted to experiment. In the photo below you can see that the inner bark with it’s outer bark shell is the darker, orangeish brown layer on the outside. It is started to separate from the wood just a little since I let this log sit a week before processing. It was still easy to work with, but I imagine after a couple weeks the log would be too dry and would need to be soaked before processing. In this post I’ll focus on my efforts with the inner bark. Splints will be for next time! When looking for a tree you want a completely straight and branchless section of trunk. Mine were about 8 inches in diameter and about 4 feet long. Longer would be better, but I’ll take what I can get. I cut the logs and brought them home for further processing. 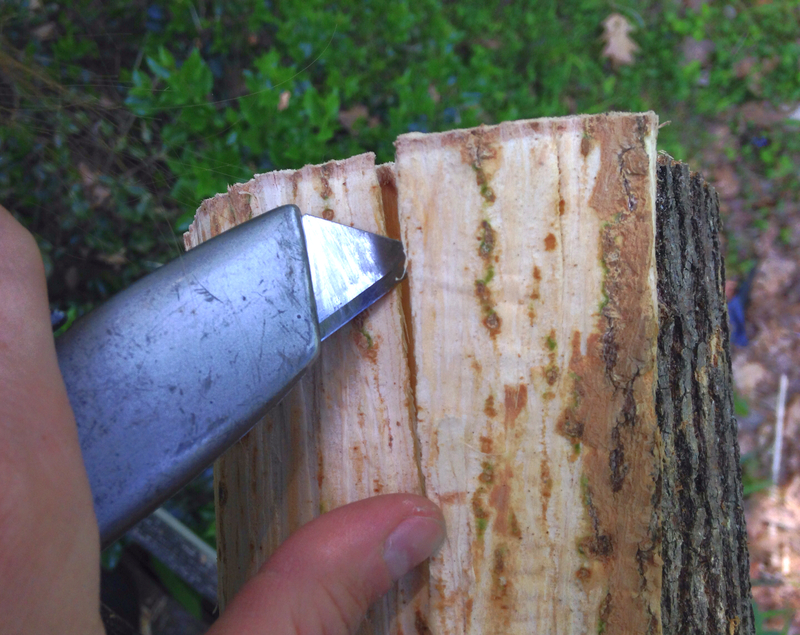 The first step is to use a draw knife to remove the outer layer of flaky bark. If there is anything I learned from this experience it is that draw knifes are awesome! I got mine at a flea market and sharpened it on a grinding wheel to get the edge back. You could also use a knife, but it will take much longer. 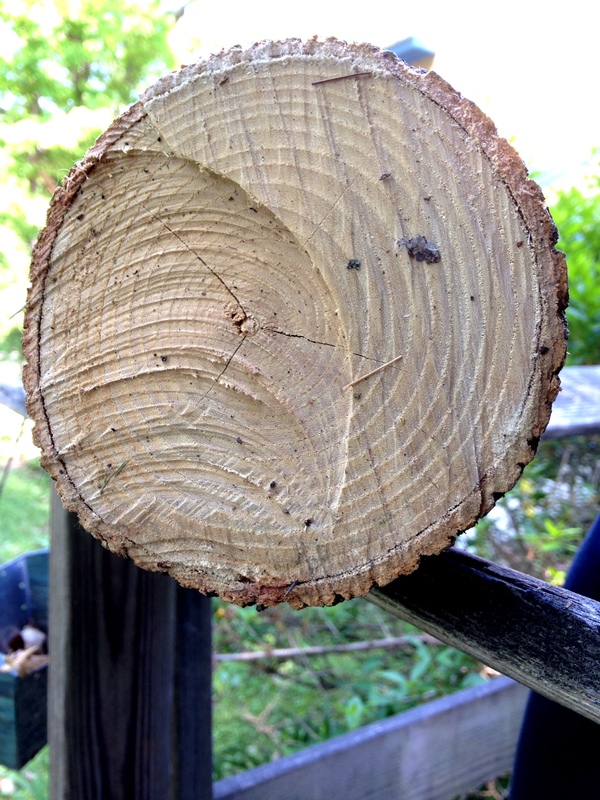 I wasn’t sure how deep to cut when removing the outer bark, but decided to be liberal about it. I went just a little bit into the fleshy white inner bark to insure that no remnants of tough, outer bark remained. Once the entire tree has been cleaned of outer bark it is time to peel strips of inner bark off. Taking a sharp utility knife I cut a straight line all the way down the length of the log. 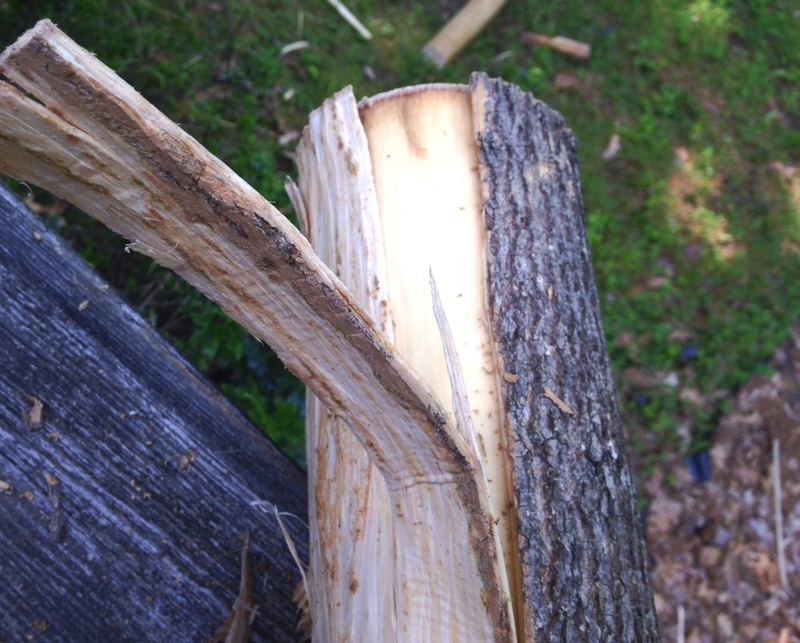 Then I cut another line the entire length of the log about an inch and a half to the side of it, making a strip. You could do a smaller or wider strip as well I think. Then you can work your knife into the edge to get started and peel the entire strip off like peeling a banana! It’s really easy and rewarding. Continue peeling strips off until you have gotten all the inner bark off the log. 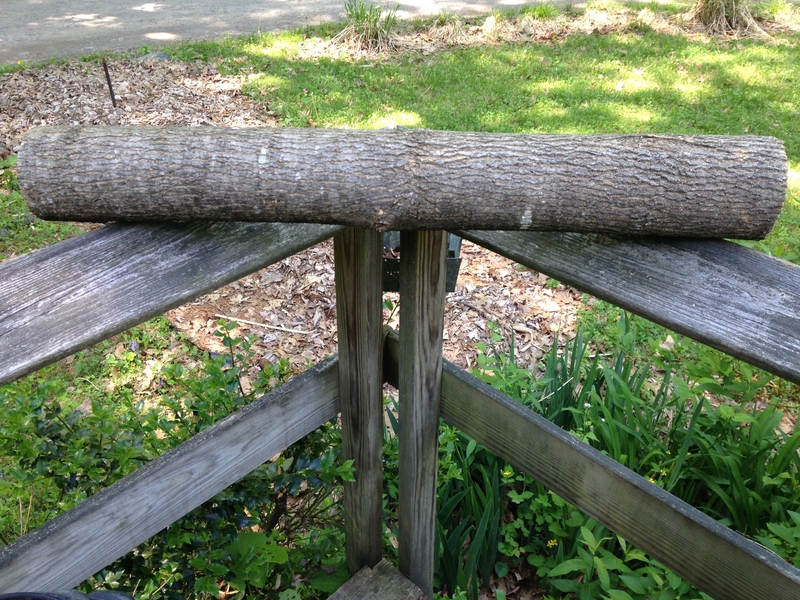 You will be left with a solid wood log that is ready to be pounded for splint making. Trust me, you will wish that process was as easy as removing the inner bark! You can then coil up your pieces of inner bark and let them dry. 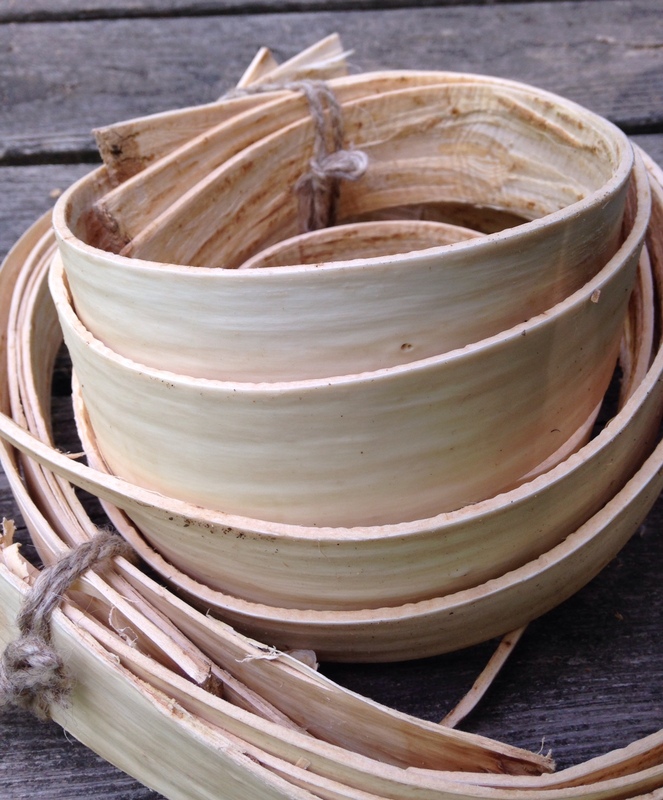 To use them for weaving just rehydrate them in hot water for up to an hour depending on how thick they are. After you have soaked them you can cut them into thinner strips or split them. 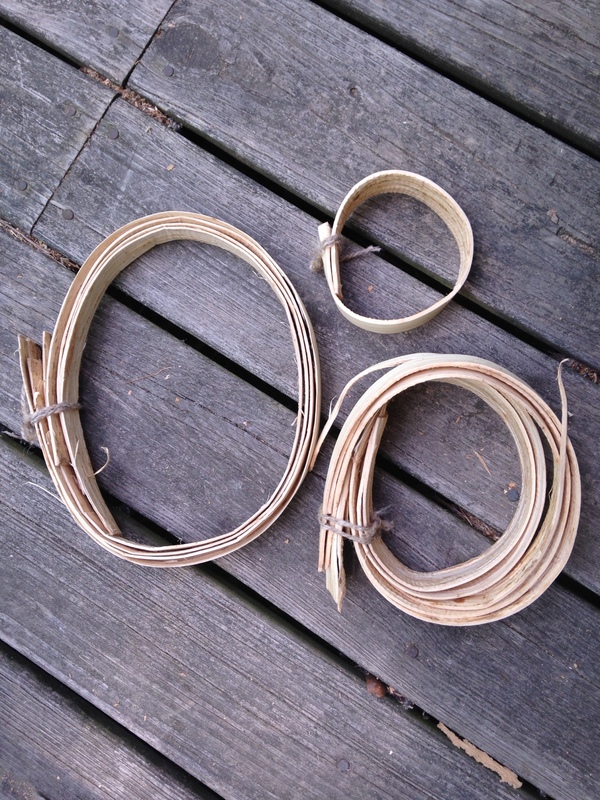 About white ash for baskets. 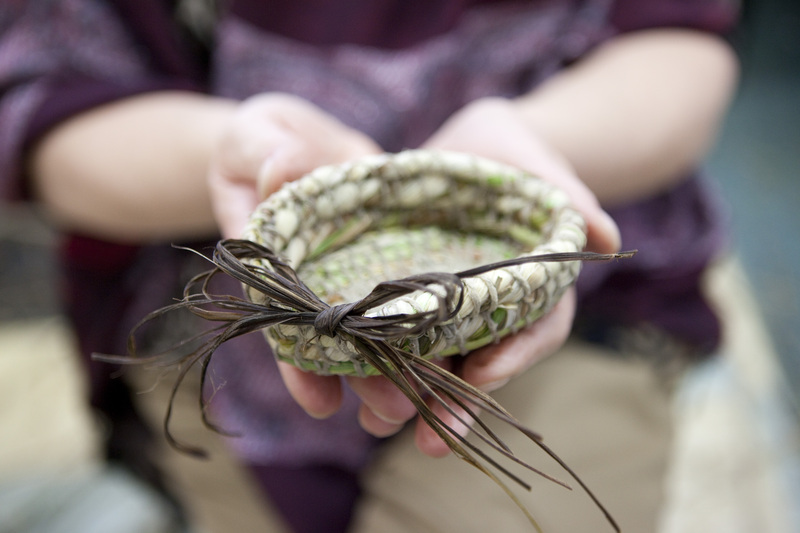 A few years ago I was in Nova Scotia, visiting a Micmac basket maker. They don’t have black ash there, only white. He soaks the logs in a pond over the winter before pounding them. His baskets are gorgeous. I bought a pretty good sized one with a leather strap intended for collecting. If you have trouble getting splints when you pound the log, maybe try the soaking method first. Seems to work up there. 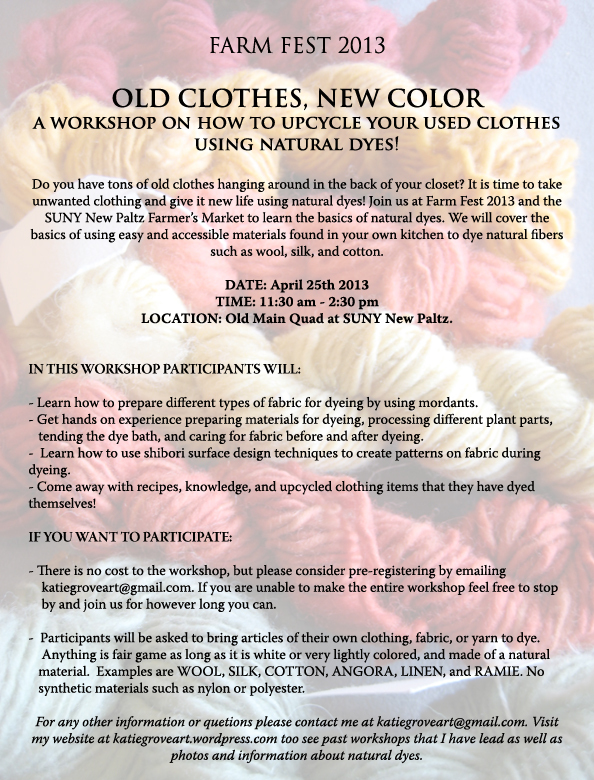 Your descriptions of gathering and preparing various materials are wonderfully clear. Thanks. Hi Kit! Thanks so much for that suggestion– I am definitely going to try it with my last log. It seems like that would allow it to separate much more easily.